The first issue of “TUTUN – DUVAN” was published in January 1951 as a monthly journal. Seven initial issues were published by that title, while the last three issues from 1951 were published under the title “TUTUN – DUVAN – TOUTOUN”. From 1952 to 1961 it was published as "TUTUN – LE TABAC" and "DUVAN - LE TABAC", and from 1962 until now it has been published as “TUTUN/TOBACCO”. So, now it is sixty one year of continuous publication of this journal. In its long history, the journal was published with variable dynamics – from once a month in the beginning to bimonthly later. In the last ten years, depending on the circumstances, it has been issued quarterly, or six times a month, or even as a yearbook. 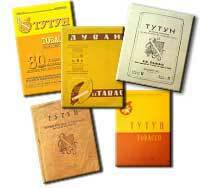 Until 1961, TUTUN/TOBACCO was published as bilingual journal in Macedonian and Serbian. From 1962 up to 2010, it was published in Macedonian and only the manuscripts by the authors from former Yugoslav republics were published in their native languages, while those from the other countries were translated into Macedonian or English.In 2010, on the occasion of its 60-year jubilee, TUTUN/TOBACCO became an international journal, with editorial board consisting of 27 prominent scientists from 8 countries. Presently, it is published semiannually (1-6 and 7-12) in English, with abstracts translated into Macedonian. In the past sixty two years, 329 issues of the journal were published on 20178 pages.